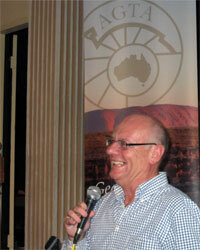 Tim Costello AO became Patron of the Australian Geography Teachers Association (AGTA) in January 2011. Tim Costello in his the current role as Chief Advocate (previously Chief Executive Officer) of World Vision Australia he is well qualified to speak on the role and value of geography. As a student he excelled in geography and his outstanding work in the field of social justice makes him well qualified to represent the voice of Australian geography teachers. His conclusion that “Our children need a great education that equips them to be global citizens in an increasingly globalised world — and our world needs engaged and well-educated Australians with a global ethic” matches the view held by AGTA and we are greatly honoured to have a person of such high standing in the community accept the role to be patron of AGTA. In July 2004, Tim Costello AO was named Victorian of the Year 2004 and in June 2005, he was made an Officer of the Order of Australia (AO). He holds a number leadership positions in the community and his work has been recognised through numerous awards including the 2008 Australian Peace Prize awarded by the Peace Organisation of Australia. The appointment of Tim Costello AO as Patron reflects AGTA’s desire to increase the profile of geography in the media and general community, especially at this time when geography is being included in the new Australian curriculum.